Psoriaflora Psoriasis Cream / 1 oz - Nature's Way®. 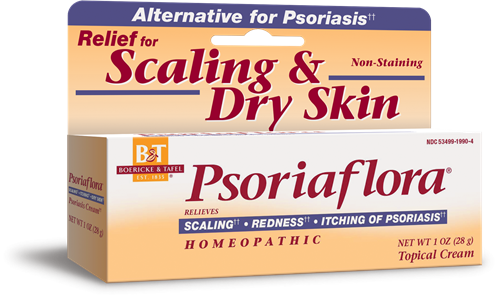 Psoriaflora® cream contains tincture of Berberis aquifolium, which provides relief from scaling, dry skin, redness, and itching associated with psoriasis.†† Unlike coal or tar based treatments, it is pleasant to use and will not stain skin or clothing. Psoriaflora contains no salicylic acid, corticosteroids or synthetic medicines. Adults & children 2 years of age and older: apply to affected area up to 4 times daily. Rub in gently. Do not use if hypersensitive to this or any ingredients in this product. Stop use and ask a doctor if increased skin irritation, rash or other allergic reaction develops. Condition worsens or does not improve within 7 days. These could be signs of a serious condition.